The Mesa Verde area is a collection of several neighborhoods all located in the Mesa Verde section of Costa Mesa. Mesa Verde is one of five unique sections of Costa Mesa. The Mesa Verde section of Costa Mesa is bordered on the north by the 405 Freeway, on the East by Harbor Blvd, on the South by Adams Blvd and Fairview Park and on the West by the Santa Ana River Trail. Unlike other areas of Costa Mesa, the Mesa Verde section was developed slightly later with greater attention to design and neighborhood lay out. Mesa Verde is considerably more thoughtfully laid out than neighboring sections of Costa Mesa. Development in the Mesa Verde area began in the late 1950’s and early 1960’s. The Buccola neighborhoods did not start developing until the 1960’s and early 1970’s. The final development within Mesa Verde was completed in 1978 along Starbird Drive in the Upper Bird Street area. 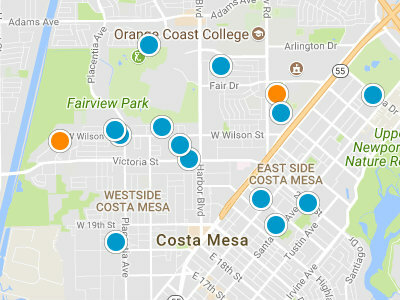 There are 30 different neighborhoods which make up the Mesa Verde section of Costa Mesa. This is strong family centered section of Costa Mesa with many parks and an exceptional library. Mesa Verde is also home to the Mesa Verde Country Club, which is a popular private country club in the northern section of Mesa Verde. Mesa Verde Villas are located on Iowa Street. This condo complex was built in 1971. These are two story condos that range in size from 900 square feet to 1,000 square feet. Each condo has a one car garage and many have enclosed patios. The condo units in Mesa Verde Villas are priced between 220,000 dollars and 250,000 dollars. This is a great entry point into the Costa Mesa real estate market. The homeowners’ association provides a community pool for the residents use. The homeowners’ association dues are $225 per month. The homeowners’ association has recently reroofed the complex and painted all fences. Residents are very close to nearby shopping, dining and entertainment options. Schools are within walking distance. The beaches are just five miles away. The 55, 405 and 73 Freeways are just a short drive from Mesa Verde Villas. The Orange County Fairgrounds, Orange County College, South Coast Plaza and Vanguard University are close by. Mesa Verde East is a quiet neighborhood of single family homes. Mesa Verde East was built in 1959. Homes are just blocks from shopping, dining, and entertainment. Families can walk to the park. The beach is just ten minutes away, while the 405, 55 and 73 Freeways are just five minutes away. Mesa Verde Island Streets Homes have a fantastic location. These homes are closely situated to the Mesa Verde Inner Loop, local schools and the library. Marina Series is single family home neighborhood with a fabulous location. These homes were built from 1962 to 1963. The square footage, in Marina Series Homes, is between 1,600 square feet and 2,500 square feet. Many homes have swimming pools. The prices will range from 505,000 dollars to 720,000 dollars. These homes are within walking distance to Balearic Park, Fairview Park and the historic Sepulveda Adobe. Residents are also very close to local schools, shopping and dining. Homeowners’ can take the bike trail directly to the beach. Mesa Verde Center is also within walking and biking distance. Mesa Verde Custom Homes is one of the few neighborhoods in Mesa Verde with a mix of new construction and original homes. The community was originally built from 1960 to 1963. The new construction is as recent as 2010. The original homes are single story and the new construction homes are two stories. Homes range in size from 1,450 square feet to 5,000 square feet; the new homes are on the larger end of the scale. Mesa Verde Custom Homes is located in the prestigious Inner Loop area. Many homes have private backyard pools. The homes range from 730,000 dollars to 760,000 dollars in Mesa Verde Custom. The homes back onto Mesa Verde Country Club. Residents are close to Balearic Park and Fairview Park. The Mesa Verde Newport neighborhood is family oriented community of single family homes. This community was built in 1960. The homes are in the 1,950 square feet to 2,000 square feet range. Many homes have backyard swimming pools and spas. The prices are in the upper 600,000 dollar range. Mesa Verde North neighborhood is a single family community that encompasses the lower Bird Streets of Mesa Verde. Homes were built from 1961 to 1971, in this neighborhood. Mesa Verde North homes range in size from 1,300 square feet to 2,200 square feet. Homes in this area are price from 385,000 dollars to 690,000 dollars. Residents are located just three blocks from the entrance of the Santa Ana River bike trail, which they can then ride directly to the beach. Residents can also walk to Fairview Park and Moon Park. Local shopping and dining are within walking distance. Students attend to award winning schools in the Newport Mesa Unified School District specifically California Elementary School, Tewinkle Middle School and Estancia High School. Mesa Verde Estates I is a wonderful single family community made up one story and two story homes. This neighborhood was built in 1957 and 1958. These homes range in square footage from 1,300 square feet to 3,000 square feet. This neighborhood is known for their large backyards, many with pools and fruit trees. The prices are between 450,000 dollars and 610,000 dollars. Mesa Verde Estates I is located near the Mesa Verde Country Club and Golf Course. Residents are just a bike ride from Newport Beach and Huntington Beach. Local schools and the library are within walking distance. Just a short drive away is the South Coast Plaza, the Orange County Performing Arts Center, Orange County Market Place and the John Wayne Airport. Students attend schools in the distinguished Newport Mesa Unified School District. Mesa Verde by Dike/Colegrave homes are all about the great location. These are near South Coast Plaza, Newport Beach and many local parks. 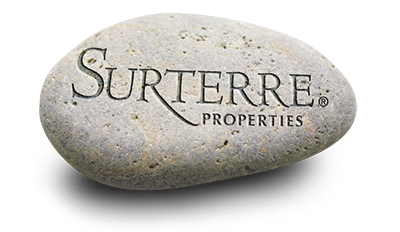 Residents can walk to restaurants, shopping, the Costa Mesa Golf Course and Family Fitness. Many of these single family homes are ranches. Homes average approximately 1,600 square feet. The prices in the Mesa Verde by Dike/Colegrave neighborhood range from 500,000 dollars to 550,000 dollars. Mesa Verde North homes are located on the Lower Bird Streets and the State Streets. This neighborhood was built between 1965 and 1971. These homes are between 1,300 square feet and 1,900 square feet. Many homes are ranch style; however there are also two story homes in this neighborhood. Many homes have been remodeled and upgraded. This neighborhood has large backyards, many with pools and fruit trees. The prices range from 500,000 dollars and 700,000 dollars. Residents can walk to Moon Park, local schools and shops. The beach is just a short bike ride away down the Santa Ana River Trail. The Mesa Verde Collection homes are newer than many neighborhoods in Mesa Verde. This neighborhood was built from 2000 to 2002. Homes are in the 3,000 square foot range. This community is known for their large backyards. These homes have views of the greenbelt and the local park. The prices range from 745,000 dollars to 900,000 dollars. The neighborhood amenities include an association pool and tot lot. The homeowners’ association dues are approximately $135 dollars a month. There are not any Mello Roos fees in this neighborhood. Residents are in close proximity to the Costa Mesa Country Club. Students attend the Huntington Beach Union High School. Mesa Verde Estates II is located in the prestigious Upper Bird Streets of Mesa Verde. This community was built from 1959 to 1972. These two story single family homes range in square footage from 1,690 square feet to 2,800 square feet. Mesa Verde Estates II homes have large lots, many with swimming pools, spas and fruit trees. The home values range from 600,000 dollars to 800,000 dollars. Students attend schools in Newport Mesa Unified School District, specifically California Elementary School, Tewinkle Middle School and Estancia High School. Tanger Park is just a quick walk from these homes. This neighborhood is close to the 55, 405 and 73 Freeways and the South Coast Plaza. Residents can bike to the beach down the Santa Ana River Trail.